Will the F-35 Live Up to the Hype? Interservice and multi-national rivalries could undermine the Joint Strike Fighter. Then again, we may never know. Air-power heretic Rob Farley wonders whether the F-35 Lightning II stealth fighter will rule the skies. Heck, I dunno. The F-35 finds itself in the same limbo inhabited by platforms like the littoral combat ship, the DDG-1000 Zumwalt-class destroyer, and the CVN-78 Ford-class aircraft carrier. Proponents have advanced ambitious if not extravagant claims on each program’s behalf. Hardware and crews must now deliver on their promise. Or not. To make matters more perplexing, we may never know for sure whether these platforms deserve their hype. Combat is the ultimate arbiter of how a weapon system performs in specific tactical settings in concert with other systems. While the strategic competitions ringing Asia may turn hot, applying this harsh standard, they may not. A prolonged strategic competition like the Cold War leaves questions about real-world battle performance largely conjectural — and can prompt even expert commentators to infer conclusions that the historical record may not fully justify. So time will may tell about the F-35’s prospects. The Naval Diplomat has only one depth to plumb vis-á-vis the beleaguered warplane. That relates to the political science of interagency and multinational weapons ventures. The Lightning II is both. Versions of the aircraft will join the U.S. Air Force, Navy, and Marine Corps. As Rob notes, furthermore, about a dozen allied air forces will field F-35 contingents of various sizes. That means quite a few voices have had a say in the aircraft’s research and development. Compromises have been struck. In a sense, then, the F-35 program is an alliance among dissimilar industries, governments, and armed forces. Alliance politics, national strategic cultures, and bureaucratic culture help explain the program’s past while suggesting what its future may hold. It’s fair to say, for instance, that who has the gold makes the rules in multinational endeavors. The classic example from international politics is how influence swung from London to Washington during World War II. President Franklin Roosevelt deferred to Prime Minister Winston Churchill during the early going, while American industry was gearing up and the United States was raising an army and building a two-ocean battle fleet. By 1943 American factories were churning out war materiel in vast quantities, the army was in place, and the two-ocean navy was arriving in key theaters. The United States was contributing more than Great Britain to the allied effort, and FDR emerged as the senior leader in the Grand Alliance. Similarly, Washington, by far the biggest buyer of F-35s, has enjoyed the dominant say in the R&D phase. That will doubtless remain true as the plane nears operational service. But let’s not oversimplify. Being the senior partner in an undertaking doesn’t confer the authority to ride roughshod over junior partners. Few successful coalitions have been of the command-and-control variety. Consensual arrangements built on give-and-take among the partners tend to fare better. Wise coalition leaders make their partners into stakeholders, advancing the common cause. The United States had a stake in preserving the Grand Alliance, just as it had a stake in vanquishing the Axis. The alliance was a goal as much as it was a means to an end. Likewise, the Lightning II consortium is an end in itself. It’s not just about fielding a navy to grapple for control of the wild blue or rain ghastly dew on land targets. 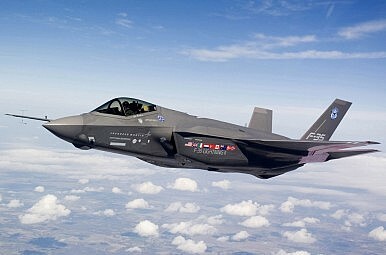 Because it does prize foreign partnerships, Washington will find it hard to, say, cut back on the size of the F-35 buy. R&D and miscellaneous costs are divided by the number of units manufactured, so reducing total numbers drives up the cost of each unit for each purchaser. That’s a heavy burden to impose on friends and allies. Canceling the program altogether would be worse by an order of magnitude, leaving air forces with nothing to show. In a sense, then, the plane’s combat performance is almost beside the point. It has to work because the exigencies of international cooperation demand that it work. Just as FDR strove to accommodate British and Soviet interests in the latter phases of World War II, today’s leadership will allocate resources generously to make the combined enterprise deliver. It’s worth noting, furthermore, that interagency and interservice endeavors are a variant of alliance politics. As commentators from Graham Allison to J. C. Wylie to Carl Builder have pointed out, armed forces operate in very different mediums — land, sea, air — and thus think about strategy and force structure in very different ways. Where you stand depends in part on where you sit (or march, or fly, or steam). The fine young cannibals over at War Is Boring have opined, rather outspokenly, that the F-35 risks being substandard because it’s a product of bureaucratic compromise. Whatever the truth from an engineering standpoint, all weapon systems involve tradeoffs among competing priorities. Trying to reconcile the needs of U.S. Air Force, Navy, and Marine aviators, let alone foreign air forces, only compounds these difficulties. The more customers, the more compromises — and, potentially, less excellence along any given parameter. Call it an aerospace culture war. Wags say a camel is a horse designed by a committee. One hopes life isn’t imitating humor. But it wouldn’t be the first time. A new report alleges that an F-35A was defeated by the very aircraft it is meant to replace. New Snowden Documents Reveal Chinese Behind F-35 HackWhy US Allies Shouldn’t Free RideCan America Build “Coalitions of the Willing?”Abenomics Threatens Japan’s F-35s?An Age of Land-Based Sea Power?